In additin to USC items all other items which are not included in USC assortment list can be sold. One Person One Franchise License. 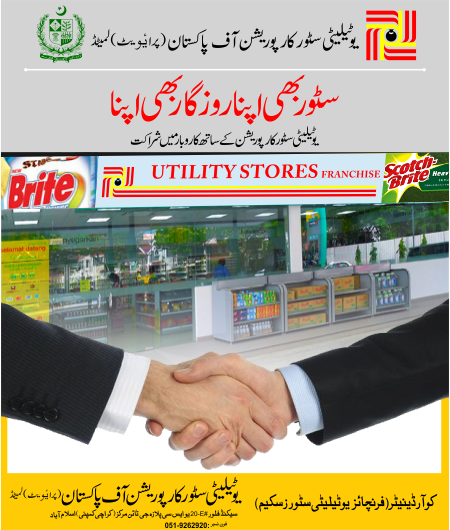 Subletting of Franchise Utility Store is not allowed. Rs. 5000/- Registration Fees (non refundable). Rs. 10,000/- Security Money (Refundable) will be deposited after approval of Franchise License. Purchase against Advance Payment through bank draft/pay order. Viability at the sale of Rs. 300,000/- per month. More than one store allowed in a union council provided the intra store distance i.e. ½ km (0.5 km) is maintained. Franchisee can opt out of the scheme at one month’s notice. Any store achieving a sale of Rs. 300,000 per month is viable for the Franchise Initial investment of Rs. 200,000 for urban areas and Rs. 100,000 for rural areas are required. Age limit 18-65 years. Minimum Educational Qualification is Middle. More than one stoer allowed in a Union Council with condition of inra store distance is at least 500 meters. Stay informed on our latest news, jobs, tender etc!